Quite a while ago, I stumbled across a little gem on Steam called Endless Space, a turn-based strategy game set in space. At the time, the game was in an open beta and, as a result, it was imperfect but kind of fun. That changed once the game went gold, though. I quickly got hooked and kept playing it, chasing after victory with each faction. So when I heard that Amplitude Studios, the guys behind Endless Space, was working on a new turn-based strategy game, one set on a sort-of fantasy world, I knew it would be inevitable that I would wind up buying it. And I have. 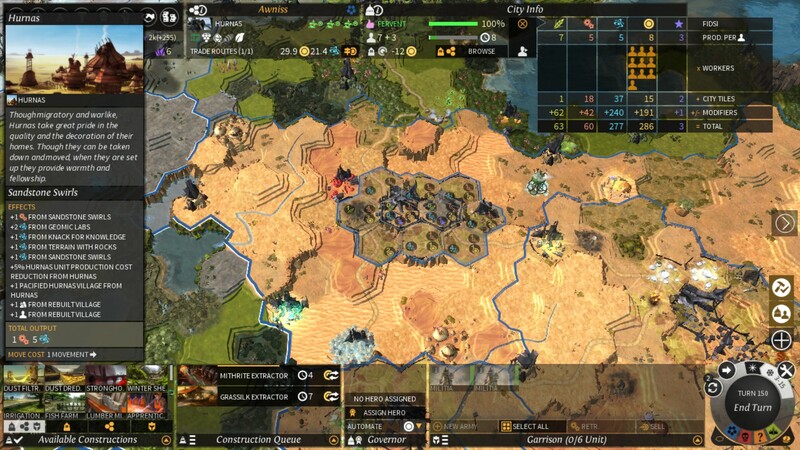 The game is called Endless Legend, and it is a lot of fun. The game is set on a planet called Auriga, one that has been ravished by a series of natural disasters. Now, different factions are clawing their way out of the ashes and trying to dominate their world. You can conquer it, dominate it through trade, wage a more peaceful campaign based on diplomacy, achieve greatness through scientific discovery, and so on. In some way, it’s a typical strategy game. You have to build cities, collect resources, raise armies, that sort of thing. What makes the game truly unique is the way that each faction has a different strategy. The Broken Lords, for example, don’t need food. Instead, they rely on dust, the mystical money used in the game. The Roving Clans are merchants and, as such, can’t go to war themselves, but they are in control of the marketplace that all other factions use. The Cultists can only have one massive city, but they can go out and proselytize the minor races that populate Auriga. For the most part, this is a really enjoyable game, but there are a few hiccups to it. Most annoying is the fact that there isn’t a really good tutorial system in place. There are concepts and ideas that are never really explained and are left for the player to discover by trial and error. For example, in my first game, I didn’t know when or even if I should expand my cities. I didn’t know what would happen if I did or what benefits I would gain. Since then, I think I’ve figured it out, but I’m still not sure. The combat is also a little on the bland side too. It’s a sort of rock-paper-scissors sort of deal, where certain kinds of troops have a natural advantage over others. There’s a little bit of strategy to it, but not as much as some people might like. All in all, though, the game is fun and definitely worth checking out.